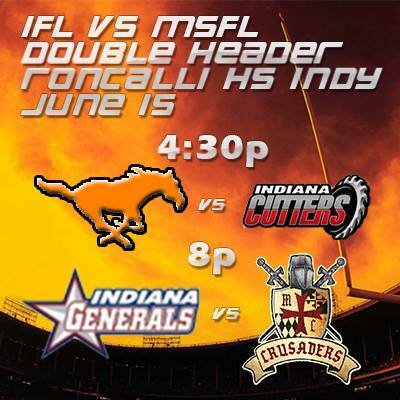 On Saturday, June 15th the Indiana Mustangs will be taking on the Indiana Cutters at Roncalli High School at 4:30pm. This game will be the first of two at Roncalli as two teams each from the Interstate Football League (IFL) and Mid States Football League (MSFL) battle in inter-league play. The four teams are based out of the Indianapolis-metro area. The Indiana Cutters and Marion County Crusaders will be representing the IFL while the Indiana Mustangs and the Indiana Generals will be representing the MSFL. The Mustangs and Cutters will battle it out in the first matchup while the Generals and Crusaders kickoff the second game approximately at 8pm. Tickets for this event will be $10 and that will give you access to both games. Four of Indiana’s top minor league football teams will be taking the field this coming Saturday starting at 4:30pm with the Mustangs vs the Cutters then followed by the Generals vs the Crusaders. Catch all of the action at Roncalli High School (3300 Prague Road, Indianapolis, IN 46227).